After the Second World War which put an end to centuries of internal struggles on the European continent, the total destruction and the millions of lives lost made realize that the solution could only be found in peaceful understanding between the European nations. The French and German post World War II leaders understood the necessity to foster friendship relations between them ; this resulted in the Elysée Treaty in 1963. 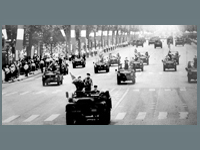 Konrad Adenauer and General De Gaulle were the driving forces behind this reconciliation. 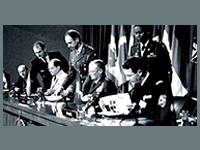 The treaty already included cooperation in the defence domain. 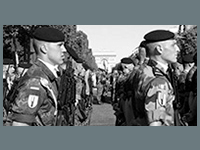 In 1989 a further step in French German defence cooperation was realized with the creation of the French German Brigade (5.000 soldiers) based in Müllheim (Germany). In October 1991, the French President François Mitterrand and the German Federal Chancellor Helmut Kohl, were eager to increase the visible signs of the reconciliation between France and Germany while fostering simultaneously an idea of European Defence. 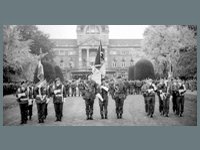 A few months later, May 1992 both governments decided to set up in Strasbourg a French-German Corps Headquarters, where both nations would share equally the command but also the burden. Eurocorps was born. Shortly after, the French and German governments decided to open this headquarters to members of the Western European Union.